House, 7 Bedrooms + Convertible bed(s), 3.5+ Baths, (Sleeps 12-16). 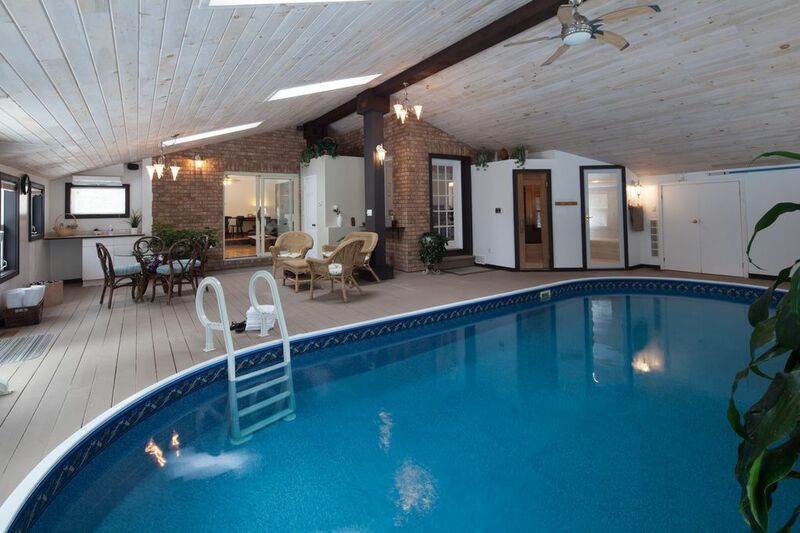 A vacation home for guests who want something special--personal use of a recently redecorated 6 bedroom luxury home with a heated indoor pool, sauna and steam room. Owners (or their managers when they are away) live in a separate apartment over the attached garage and are available for assistance and information. The house is located on a 2 acre wooded lot in a 30 home subdivision in west Ottawa. The adjacent homes are also on 2 acre lots. Our business name is Countryside Retreat. Vacation rental guests enjoy a luxury home with a fully equipped kitchen, eating room, family room (wood fireplace, TV), dining room, living room (51-inch TV and home theatre system), unlimited high speed internet data, VIP cable TV package, laundry room, choice of 2 master bedrooms with ensuites or 4 guest bedrooms (2 on 2nd floor, 1 on main floor and 1 in the basement), patio with propane BBQ (in season), exercise room and a sun room with a heated indoor pool, sauna and steam room. Vacation rental guests enjoy total privacy in the home. There is only one set of guests at a time. Ideal for guests who want their own private vacation retreat. Also ideal for wedding groups, reunions or any group that is traveling together. The owners or their replacements when they are away will always call before entering the rented premises (the pool must be inspected daily to monitor sanitization and water levels). Minimum rental requirements required for July, August, Christmas, New Years and holiday weekends (see rate chart for details). Surcharge of $125.00 to $350.00 for 1 day rentals. DEFAULT SETTING ON RATES IS IN US DOLLARS. CHANGE TO CANADIAN DOLLARS BY CLICKING ON THE USD FLAG IN UPPER RIGHT CORNER ON THE RATE CHART AND THEN CLICK ON THE CAD FLAG. THE BOOK IT FEATURE CONVERTS TO CANADIAN DOLLARS IN THE LAST STEP OF THE ON LINE BOOKING PROCESS. YOU MAY CONTACT US DIRECTLY FOR HELP IN GETTING A QUOTE IN CANADIAN DOLLARS. Payments can be by cheque/check, bank transactions or credit card. The name on the rental agreement must match the name on the credit card. On check in, the credit card used to book the property must be presented along with government photo ID to verify that the name of the renter matches the name on the credit card. All emails are answered. If no reply is received, please resend your inquiry. What a blast. Always great to get together with high school friends. This was our third year at the house....and every year seems to get better. Thank you so much for the use of your beautiful house. As always, we enjoy the deer in the back yard. This house was excellent. It was everything we expected from the pictures and the positive reviews it has received from prior renters. My nieces, nephews and children range in age from 1 to 17 years and the pool was a hit with all the kids and adults. The house was very clean and accommodated all of our needs during our stay. The renters were great and responsive as we had a couple of questions. My family and I highly recommend this rental. Everything about our stay was perfect! Very clean, spacious and has everything you need! We’ve found our rental house for our family Ottawa trips. Thank you! 9 friends shared this lovely home for 4 days. Gave us great space to visit and retreat. Very well maintained facility with a warm pool and comfortable sleeping arrangements for all. Ted was a helpful and available host when asked, while allowing us complete privacy. The kitchen had all the things we needed for great meals. Everyone agreed that they would rent again if the opportunity arose. Countryside Retreat is located on a wooded 2 acre lot in a west Ottawa subdivision. It is an 20-25 minute drive to downtown Ottawa (historical buildings, museums, restaurants, shopping, seasonal markets, skating on the Rideau Canal & more). Closer to home, there is the Ottawa River (boating, fishing, swimming & sailing), Canadian Tire Centre for NHL hockey & concerts and numerous stores and restaurants. Just across the Ottawa River is Quebec and the Gatineau Hills- hiking, fall foliage, skiing, shopping and Casino Lac- Leamy (gambling, shows & fireworks). The rate for 4 guests ranges from $390-$450 CAD per night plus tax (13%). Additional guests are charged $35.00 per person per night plus tax (13%). Pet fee of $15.00/day plus tax (only non shedding, house trained dogs that must be kept on main floor and not on the couches or chairs). One night rentals: available for 4-16 guests for a surcharge of $125.00-$200.00 (not for spring break, summer or holiday bookings). We do not have a fixed changeover day so we sometimes have space available that allows us to accept bookings that do not meet the posted minimum number of nights requirement. Please check our calendar to see if these time periods suit your needs. Discounts are often available for bookings that fill out our calendar and for last minute bookings. These discounts are not applied by the book it/quote system which uses the base rates. The $500.00 refundable damage deposit can be paid in CASH on check in (CAD or USD) or it is to be included in the balance due payment. The $500.00 damage deposit is refunded by cheque or electronic funds transfer (where available) within 2 days of check out (to allow for the house to be cleaned and inspected) or by credit card if it was paid by credit card.